Welcome to the website for the Circle Y Ranch. 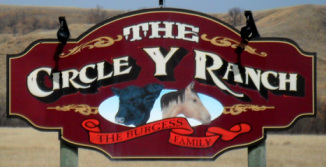 The Burgess family has operated the Ranch since its purchase by R.F. Burgess in 1937. His son, Edward Burgess resides on the ranch, and at the age of 92, still helps out with the daily ranch activities. The ranch is currently operated by Michael and Tamela Burgess. Today the ranch produces registered and commercial Angus cattle and Registered Quarter Horses. Tamela has built The Old Porch Gallery and host tours throughout the summer. This website is a place to showcase the things that are most important to our family. Our Livestock, our love of the Big Muddy and its colourful history, and environmental stewardship. We invite you to enjoy our place on the web. Contact us if you have any questions or would like to visit the Circle Y. The Burgess family is providing ranch- raised beef for the burgers at Ice Cream Island in Virden, Manitoba. Their daughter Tiffany and her husband, Kent Cameron opened the seasonal ice cream and burger establishment on May 19th, 2017. Using Circle Y raised beef is a source of pride for the whole family. "Being able to serve Circle Y Ranch beef in our own establishment is an amazing feeling. We are so proud of our product and knowing exactly where it came from. The response from our patrons has been the icing on the cake" said Tiffany Cameron. 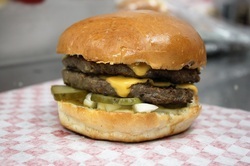 Pictured is the top selling Island Burger. A double cheese burger with ketchup, mustard,mayo, pickles and onions on a brioche bun. The community of Big Beaver was recently featured on the CTV News Hometown Tour. The Burgess Family and the Circle Y Ranch were the winners of the 2014 Saskatchewan Environmental Stewardship Award. The Environmental Stewardship Award recognizes families for their land stewardship practices. They received the award at the Saskatchewan Stock Growers annual meeting.This is the 20th Year for the Award.